A Bronx family at MASA’s Robo Jam in November. It was just another day in the life for Pablo Rivera. He was busy doing what he loved—building. With his eyes focusing through thick, dark-rimmed glasses in a sharp, determined stare, he studied an instruction manual and bent over a table to pick up dozens of beams and connectors from an overflowing Lego kit. “I am going to build a transformer,” the 8-year-old said. But the transformer wasn’t his first creation. Earlier in the day, he had assembled a robot that could crawl and a robot with tusks that resembled a warthog. His parents looked on with pride. They weren’t just watching, but learning how to build Legos with their son. 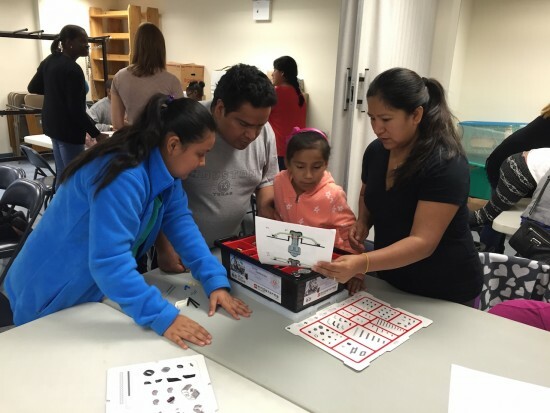 The Mexican-American Students Alliance (MASA) brought the Riveras and several other families together, under one roof in November for Robo Jam—–an initiative to promote science education through robot building among low-income Latino immigrant communities in Mott Haven. 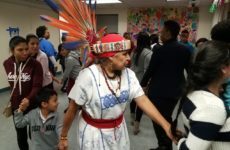 Thirty children are currently enrolled in the 12-week program, which is funded by several non-profits: the Simón Bolívar Foundation, Juntos Podemos and Latin America’s leading broadcast company, Televisa. 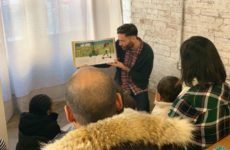 The group launched the robotics program for 8-to-10 year-olds at its new space on Third Avenue in July in partnership with a Brooklyn-based science education organization, Sunset Sparks. “In affluent neighborhoods like the Upper West Side, private companies offer these programs for $500 a week. We wanted to provide access to low-income neighborhoods for free,” said Lucero of the program, which is offered every Tuesday from 5-7 p.m. The program’s selection process is simple. Families must fill out an application form and should be low-income immigrants living in Mott Haven. MASA hopes to not only catch them young, to develop their critical thinking and deductive skills and build their confidence in careers in STEM (Science, Technology, Engineering and Mathematics); it also plans to focus on educating girls. “If I see girls just as engaged as boys, I feel like we are doing something good here,” said Yadira Hadlett, the program’s teacher and co-owner of Sunset Sparks, which has provided free computer coding classes for immigrants in the Sunset Park neighborhood of Brooklyn since 2007. “Usually it is boys who engage in these types of activities. MASA wants to make sure that girls have access to robotics that they traditionally won’t have,” said Lucero. MASA plans to offer three extra robotics and programming classes just for girls, and to introduce them to women who work as engineers, in order to inspire them, mirroring the Girls Who Code program. According to the 2011 US Census Bureau data, only 26 percent of STEM workers were women, and Hispanics and Latinos made up only 6.5 percent of the STEM workforce. Abril Lozada, an 8-year-old student at the Immaculate Conception School in Melrose seemed thrilled as her mother took pictures of her assembled crawling robot. Her stay-at-home mother, Sandra Castillo, 34, said she wants her daughter to follow her dream— whatever it is. “While growing up, I wanted to be a pastry chef but others around me thought there was no money in it, so I didn’t do it,” said Castillo. 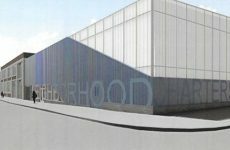 MASA has bigger plans for Mott Haven. It hosted Robo Jam events in late November and early December—not just for parents of children enrolled in the robotics program but for the entire community.